Economic development in Xi'an has long lagged behind China's coastal cities due to its relatively inaccessible inland location. Now, the city is taking advantage of the opportunity to become the starting point for the Silk Road Economic Belt, an initiative proposed by President Xi Jinping in 2013, to refashion itself into China's largest inland port and logistics center. 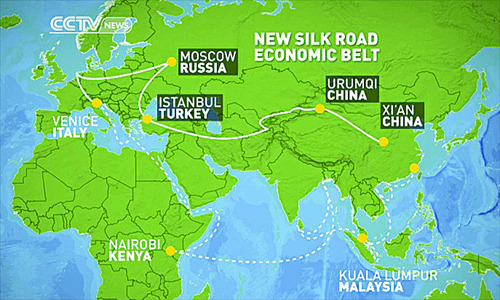 A screen shot from CCTV News shows China's plans for the "One Belt, One Road" initiative. Standing in the middle of an empty vast land in a suburb of Xi'an, He Jian spoke with undisguised excitement about the prospects for the land under his feet. "It may still look empty now. But one year later this place will be a busy logistics center for both domestic and international trade," He, Executive Deputy Director of the Airport New City in Xi'an's Xixian New Area, told the Global Times. The Airport New City, located in the Xi'an Xianyang International Airport in Shaanxi Province, will be the largest air trade logistics facility in West China. It is also expected to be one of the main engines driving Xi'an's economy in fulfilling its promise in becoming a key link in the "One Belt, One Road" initiative. Once considered one of the greatest ancient capitals of China, modern Xi'an is one of China's most popular tourist destinations and the most industrialized city in Northwest China. Xi'an has the 27th highest per capita income in the country. Economic development in Xi'an, however, has long lagged behind its coastal counterparts like Shanghai, a result of its relatively inaccessible inland location. The "One Belt, One Road" initiative, proposed by President Xi Jinping in 2013, is China's latest plan to boost regional trade with Central Asia, Russia, Europe, and other regions. The central government has made the plan a centerpiece of both its foreign policy and domestic economic strategy, with potentially game-changing implications for regional trade, investment and infrastructure development. In the action plan released in March by China's top economic planning agency, the National Development and Reform Commission, Xi'an was named as the starting point for the Silk Road Economic Belt and a new platform for further developing China's "reform and opening up" policy. "This is a once-in-a-million years opportunity for Xi'an and Shaanxi to re-emerge as the focal point for a national initiative. Xi'an is going to experience a major 'upgrade,'" Qiang Xiao'an, director of Xi'an's development and reform commission, told the Global Times. The city in March released an implementation framework for the "One Belt, One Road" plan, which includes 60 projects with a total investment of over 115 billion yuan ($18.53 billion), including science and technology, logistics, and equipment manufacturing industry. To fulfill its promise as a national logistics center in Northwest China under the "One Belt, One Road" initiative, Xi'an is currently focusing its energy on developing two logistics parks to support the trade and transport networks needed for an export-oriented regional economy, Qiang said. While the Airport New City will mainly oversee air freight, the Xi'an International Trade and Logistics Park in downtown Xi'an will focus on land-based logistics as China's largest inland port. "We are collaborating with nine coastal ports in Tianjin, Qingdao, Ningbo and Shanghai. Xi'an, with geographically advantageous location in the [center of China], will act as the confluence point for distributing cargo from coastal ports overseas," Qiang noted. "Before the new logistics parks were established, we needed to export cargo via ports in the coastal cities. Schedules were uncertain and out of our control," Qiang said. The Xi'an International Trade and Logistics Park is supported by the Xi'an Railway Container Terminal, allowing cargo to be shipped by rail to all parts of China. As for road transport, the logistics park is connected with multiple national expressways connecting it to the entire country. The comprehensive network of sea and land-based logistics will mean big savings in transportation costs and time, said Qiang, adding that the duty-free zone in the two parks will also prepare Xi'an to become China's next free-trade zone. Wen Liping, deputy general manager of Zenith Logistics, is one of the corporate leaders anxiously waiting for the construction on its storage building in the New Airport City to finish, with a completion date expected later this year. "Currently we are handling 500,000 tons of trade per year. We are expecting 8 to 15 percent growth after our new building here [in the Airport New City] is finished," Wen told the Global Times. Wen, together with his management team, started their business as an automobile sales service shop, later shifting their focus to developing logistics storage and transport as China became more active in regional trade. Ling Hong, senior advisor of another company in the logistics park, Shanghai YTO Express, is equally anxious for construction to finish on his company's new digs. The company, a leading express firm in China and major partner of online shopping giant Alibaba, boasts an average delivery volume of 1.2 million items. Its new building is part of an ambitious expansion plan. "This will be our base in the Western region, bringing about 30 to 40 percent growth. We are hoping that it could start operation later this month or in May," Ling told the Global Times. "We are developing an 'air silk road' taking advantage of our proximity to the airport. As an inland region located in Central China, Xi'an has the advantage of developing air trade with shorter flying hours to all parts of the country," said He. The Xi'an Xianyang Airport is the largest airport in Northwest China. In 2014, the airport saw more than 29 million travelers flying a total of 269 airline routes, and handled 186,400 tons of cargo. Twenty-five of the airport's routes are international, while 43 travel through the western region. "There is certainly a huge growth potential for opening more airline routes to expand Xi'an's regional and international trade," said He. The airport has so far opened six new airline routes this year to Maldives and Japan. Routes to Almaty and Rome are also expected to be opened soon, according to He. The airport is currently also planning to build a third runway to accommodate more air trade, He said. To further expand Xi'an's economic growth, Shaanxi's provincial government is accelerating the development of the Xixian New Area. The Xixian New Area, with a total planned area of 882 square kilometers and 900,000 residents, is a newly-developed district between Xi'an and the neighboring city of Xianyang. The new district, home to the Airport New City logistics park, will combine resources from the two cities and host clusters of high-tech industries, including modern agriculture, cultural and tourism industries, as well as residential areas. The development of the Xixian New Area is part of a plan to transform Xi'an into an international city. There have even been some speculations about whether the economic integration of Xi'an and Xianyang is laying the groundwork for a future boost in Xi'an's administrative status. "It's still too early to talk about this. Right now we are just focusing on building a foundation for the new area and we are excited about its prospects," Wang Peng, an information officer with Xixian's Development and Construction Administrative Committee, told the Global Times. The Xixian New Area will be divided into five clusters, including the logistics-focused Airport New City. Fengdong, located near the Xi'an High Tech Industries Development Zone, will focus on science and technology. Another cluster nearby will focus on developing tourism and cultural industries. Two others will focus on information technology and modern agriculture, respectively. On a workday evening, traffic congestion was serious on the way from the Xixian New Area to downtown Xi'an because of the construction of subway stations connecting the two areas. Commuters shuffled through the area on a workday evening through clusters of newly built office and residential buildings. The new-found urban vitality of this emerging area was the reason why Wang spoke with great enthusiasm when he was pointing at the map and introducing the development plan for the Xixian New Area, saying that many of his colleagues who graduated from prestigious universities are coming back to their hometown in Shaanxi with a sense of mission. 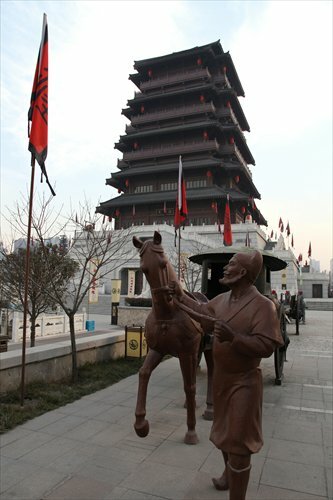 "Xi'an has always been the focus of economic development in Northwest China. Its steady social and economic development can ensure the stability of the whole northwest region," Zhang Hong, director of School of Economics and Management at Xi'an University of Posts and Telecommunications, told the Global Times. Xi'an's GDP reached 5.4 trillion yuan last year. Its 9.9 percent year-on-year growth was higher than the national average, and it also had the second highest GDP growth among China's 15 sub-provincial cities . "Xi'an's abundant resources are conducive to its development. It is rich in natural resources like coal and minerals. Its rich history and culture have also attracted many overseas students from Central Asia. We should make use of all these advantages to further expand the city's economy," Zhang noted.